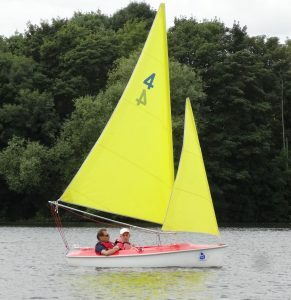 What a great day (4 August) we had to kick-off the WS Racing Summer Series at the Chipstead Sailing Club. The sun was out, the wind was blowing and we had a great turn out, especially considering a number of our regulars are away on holiday or racing elsewhere (Good luck Peter Gregory who is competing on 6 and 7 August in the RYA’s multiclass regatta weekend at Rutland Sailing Club, where they are hosting the Hansa Grand Prix Series 2016 and Hansa (European) Nord CUP Series 2016 !!). 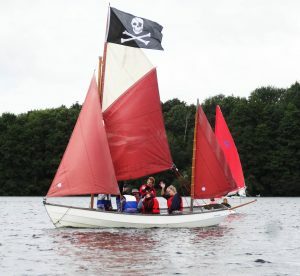 Fortunately the Pirate lugger sailing around the lake during the time of the Race did not try to board any of the Racers’ dinghies but rather gave its passengers a close-up view of the exciting racing action. There was a good 12 knot WSW wind blowing, backing to the West, and with gusts up to 20 knots which at times came from the South through the trees at the windward Mark A.
Ann Frewer set off on her own in a Hansa 2.3 dinghy with a five-minute advantage over the two double-handed 303s, which had a one minute advantage over the two single-handed 303s, which had a two-minute advantage over the sole Liberty, being sailed by a recent newcomer to the racing series, Bill Garry, and eight minutes later the 2.4s and the Martin started. The race was the usual pursuit format and this week lasted 40 minutes. The schematic below shows how the race unfolded. A standout performance was that of Mark Cayzer, sailing in a 303 with his crew James (pictured), who overhauled Ann Frewer during the second lap and then managed to stay at the head of the fleet despite the presence of the faster (and chasing) 2.4s and Martin. 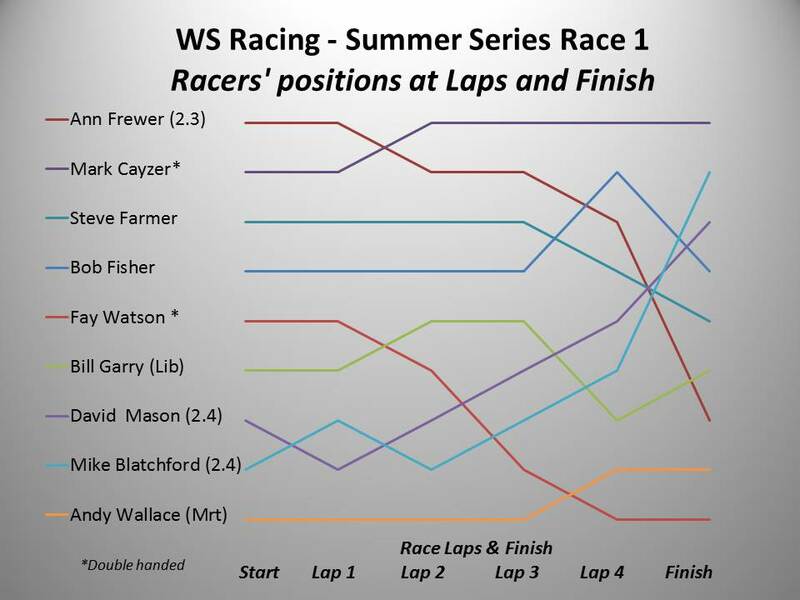 However, Mark was still 150 m in front when the race finish-whistle sounded, ahead of Mike Blatchford and David Mason, who had been playing cat and mouse with each other throughout the race and as they got ahead of the tailenders in Lap 2 and then started to sail through the rest of the fleet. Another battle on the water was between Bob and Steve, with Steve holding the advantage he gained from the start line through until the third Lap when Bob had a storming beat up to the windward mark, overtaking both Ann and Steve, and found himself in second place at the end of Lap 4. Although Bob managed to maintain his advantage over Steve until the finish of the race, they were both overhauled by the 2.4s during the fourth lap. Bill Garry sailed an excellent race and would have finished higher up the order if he had not crossed the start line five-minutes after the Liberty Start Whistle had sounded!! Ann, Andy and Fay, with her crew Di, were all on their fourth lap at the end of the race. All in all, it was an excellent race in good conditions. Well done to all the Racers!! Hi seems you all had a good day, I won’t be there next week as we are coming back from Cornwall next Thursday. But will see you the week after. Having bribed the boat handlers I was firmly in line for on e of the contender boats. However an eagle eyed Peter pointed out I was minus one life jacket and I was dismissed from the jetty in shame. Upon return was the aptly named Red Rocket And being the only skipper and boat left were paired together. 50 yards out I became aware of the rough water and took my first bucket of water onboard. As usual I found myself over the other side of the lake at the start, but luckily a strong wind was blowing and I managed to get to the start just in time to join the melee of boats. I soon found myself in line for a head on collision with Fay and Diana. I don’t know who was at fault it happened very quickly, but both craft changed direction at the last moment ( unfortunately we both decided on the same escape route ) and a fairly large crunch occurred. It took around 5 minutes to extract the crafts during which time, insurance details, pleasantries and apologies were exchanged. The not so rocketing Red Rocket limped over to the start and promptly sat facing into the wind for a couple of minutes. With the crew still licking its wounds, it toolk a timely reminder from Peter to remind me that I couldn’t sail direct into the wind. Having finally established a decent tack I slowly began to claw back the lead that my good friend ( and arch enemy ) Steve had built up. The strong winds ensured that everyone was making good progress and I finally Caught him as he replicated my sitting into the wind tactic. Next time around Ann(henceforth captain Bligh) and I were jostling for the lead (or at least I thought we were). When we approached the A buoy. Suddenly captain Bligh began yelling at me ” Starboard, water, get out of the way you land lubber etc etc. At this stage I felt I was in the right, so held course and the Red Rocket and Orange bathtub gently kissed each other, causing another verbal blast from the captain. Steve and I had crewed the lugger for Ann the previous year. I had seen her reduce salty old sea dog captains to tears on this trip and she had called Steve and I ‘Leo’ all day. So I was only mildly terrified. Normally at this stage. Peter in the Red Torpedo was performing at a higher level , although I swear I saw it in the car park). Kim serving her one week ban (see last weeks comments). Peter W, no doubt traumatised by his wert broadside last week , David in the 2.4 and Mike in the Martin would have left me in their wake, but the battle weary Red Rocket was performing well in the windy conditions and having overtaken the bathtub I was under the impression I was leading. In fact Mark and James were so far ahead, I was unaware of their existence. However aware of the power of the twin 2.4’s I had taken action to ensure they wouldn’t finish. As mentioned last week a group of us had decided a Martin should be used to broadside a 2.4 and create 2 1.2 ‘s. The obvious choice for the kamikaze mission was the most experienced Martin skipper , Mike Blatchford. Having secured his services with a huge bribe including a Mars bar, the trap was set. However because of Peters , Mike had been promoted to the elite 2.4 squad I suspect using my Mars Bar to bribe his way in. In Mikes absence he had passed the mission on to Andy. For self preservation purposesMike had no doubt changed the target to the leading 303. Mark and James were probably already opening their champagne in the clubhouse, when Andy set out on the suicide mission, striking the Red rocket admidships. Somehow the brave crew of the Red not so Rocket managed to keep her afloat and limped for the line. I looked at my watch 8 minutes from glory, if only I could keep her afloat? Suddenly two closely matched 2.4 emitting diesel fumes rocketed past. I swear I caught sight of chocolate smeared around Mikes lips as he smiled and soared past. Rudderless, de masted and battered the red Rocket battle on to a commendable 4th place, even then we had the pleasure of running aground. I did consider scuppering her their and then as a tribute to the brave little boat . Note to trustees I may have exaggerated the damage a little. Having mounted the victory steps my old buddy Gyp decided we were friends again phew! A lively debate followed about the captain Bligh collision.. Many props including discarded sandwich boxes were utilised. A number of experienced skippers were consulted and the jury firmly came down in the Capains favour. I was sentenced to 30 lashes from a cat of 9 tails. In summary a very enjoyable day, thanks guys for all your efforts. Many congrats to Mark and James for keeping the 303 flag flying. Kim I can confirm your ban is now lifted. How was Pippa’s puppy? Be careful what you wish for! I hope Bob Fisher is not the skipper undertaking the said 360. Chances are that your boat will be pranged, not that this would be Bob’s fault, of course not. Peter, some people had wondered why I had sailed such a wide route around the course. I had heard the various collisions going on behind so thought it wise to avoid Bob the pirate. How wrong I was, as he flew past me. Change of tactics for next week, I’ll follow Bob around the course…that’ll be a novelty. From my vantage point in the Race Boat, I can only report what I see……. so I am sure that every reader is indebted to be privy to the views-from-the-inside shared by Bob and Steve, so they now know more fully the tactics being used by various racers to eke out even the slightest advantage over their erstwhile friends!